I have not done a very good job of keeping this site updated during the past week on the Going To The Sun Rally. Not up to my usual standards. I managed to get the JagCam movies posted almost every day, but really haven’t been able to keep up with writing and photo editing. I will admit to having some serious challenges with JagCam footage editing… mostly to do with my now 4 year old laptop and cranky editing software. Import & Rendering times usually stretched to many hours and iMovie frequently crashed. It got to the point where I could not insert any titles or effects for fear of ruining the output, or just having hours of work vanish in a blink of an eye. So… often I would just give up and go have a drink. I’m back at home now and have a pile of work to do, most of it lots of finish work involving the deck and painting, plus some BioDiesel processing… but I promise I’ll set aside some time (and the bottle) and plow through the writing and photo editing backlog as fast as I can. Thanks for your patience! 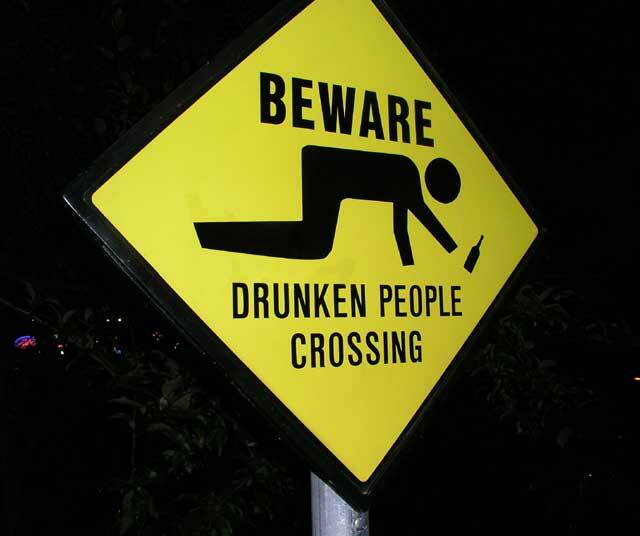 WHERE did you foto the drunken people sign? I *gotta* get one! Previous Previous post: 2008 GTTSR: Going Home. Spokane to Arlington via SR20. Next Next post: Car Photo of the Day: Summer drawing to a close.